Mobile steps with cup enclosed retractable swivel castors. Steps lower on to a firm rubber foot which protects carpets and other floor surfaces. Metal treads with ribbed rubber or slip resistant grit-like surface. Fully welded construction with a powder coated finish. Reaching items that are placed in high up areas can be challenging for employees and it comes with risks such as over stretching or the possibility of items falling from height and injuring someone. Economy cups steps with rubber treads and no handrails are a great addition to the workplace, helping to eliminate those issues and reduce risks. The mobile steps have cup enclosed retractable swivel castors, making them easily moveable around a workplace. Sheet metal treads with a ribbed rubber surface offer great underfoot grip. They lower onto a firm rubber foot when body weight is applied to the steps and the feet protect carpets and other floor surfaces or slip resistant grit like surface. They have a fully welded construction and a powder coated finish with is available in four colours; blue, green, red or yellow. 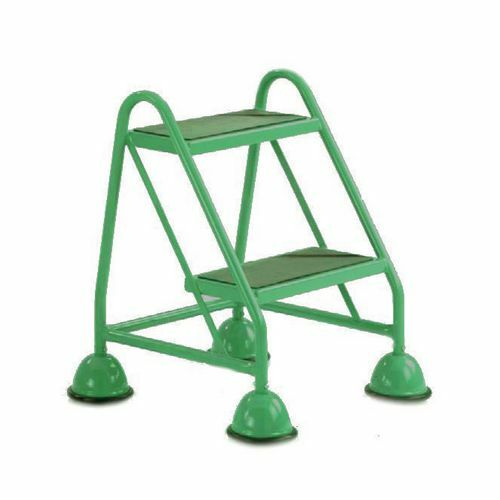 Our economy cup steps with rubber treads and no handrail are great additions to any workplace, assisting employees easily and safely accessing items which are kept high up. They come with a 12 month guarantee and FREE UK Delivery.